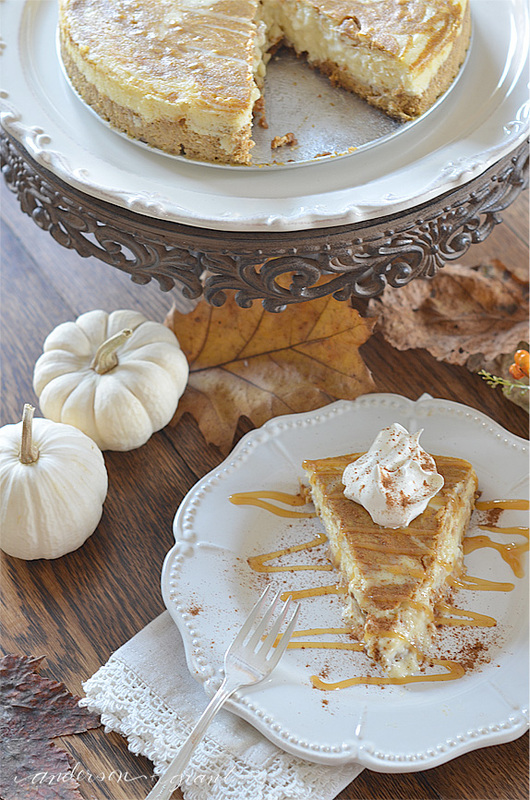 And a slice of pumpkin pie topped with a dollop of Cool Whip (and yes, it has to be Cool Whip). Is your mouth watering yet? I'm not sure how any of this came to be traditional Thanksgiving fare considering the pilgrims likely had venison, fish, and walnuts for their first celebration. Aren't we glad that meal changed? But I do know that Thanksgiving food now is really the best meal of the year. 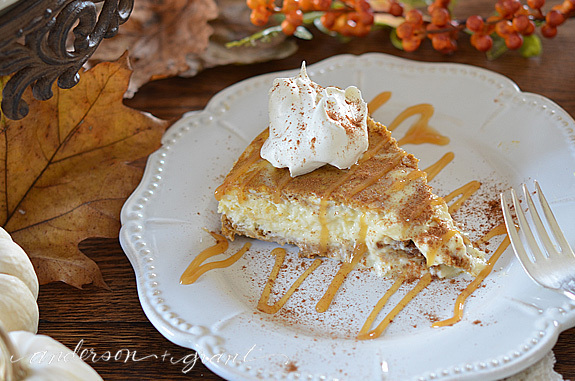 As much as I love my pumpkin pie on the holiday, today I am putting a little twist on the traditional pumpkin dessert for Thanksgiving. 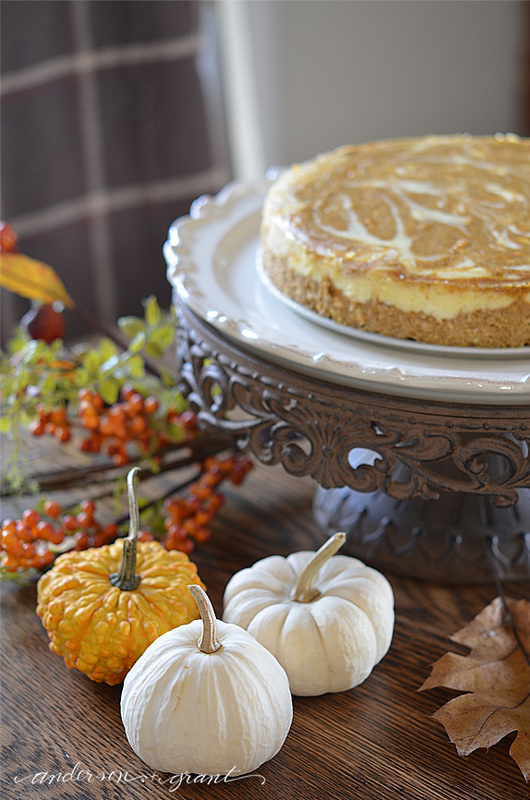 I've had pumpkin cheesecake before but this recipe for the Ultimate Pumpkin Cheesecake (adapted from Taste of Home) really takes the basic dessert to a whole other world. 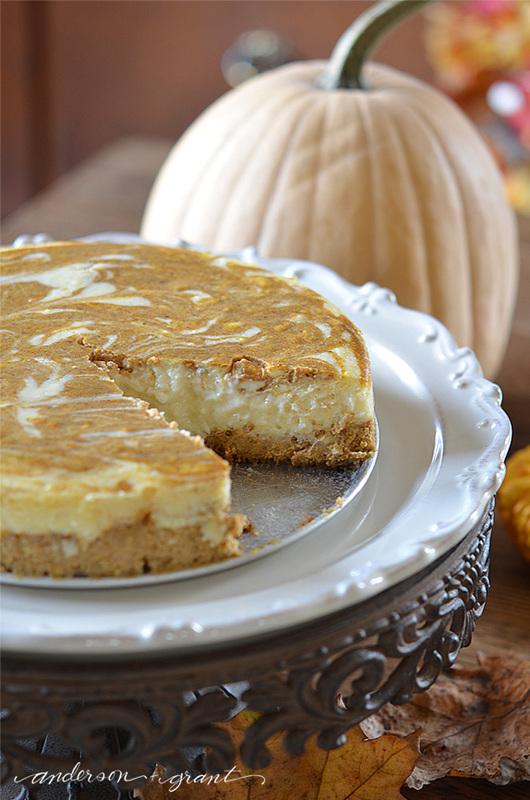 It consists of three layers of filling over a gingersnap crust. 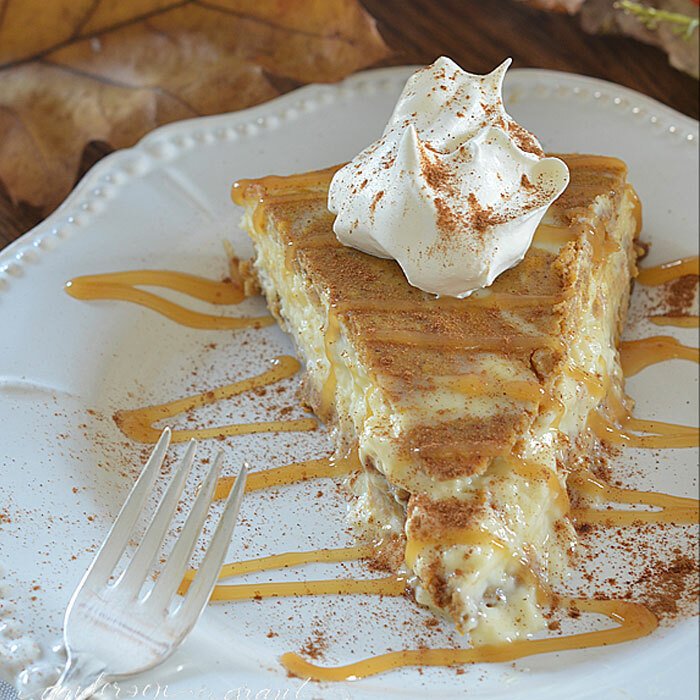 Then before serving it, the cheesecake is topped with a caramel drizzle, a dollop of whipped cream, and sprinkle of cinnamon. I can't even explain how delicious and fancy this dessert is. Just the type of thing that will impress your guests gathered around the holiday table. This cheesecake really is not as difficult to put together as it sounds. 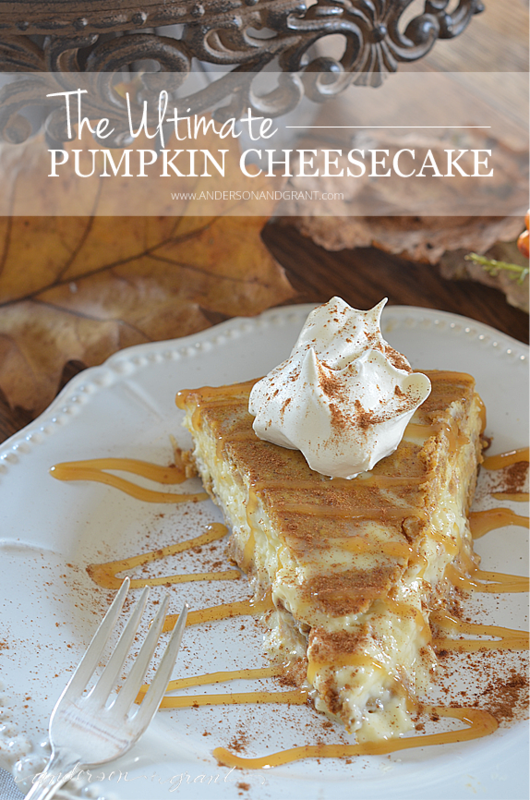 But if you'd like to make the steps a little easier, feel free to mix the pumpkin ingredients into the entire cream cheese mixture and avoid making the three different layers. Aside from that, the recipe is really easy. Preheat oven to 350 degrees. Grease a 9-inch spring form pan and place it on a double thickness of heavy duty foil. Wrap the foil around the bottom of the pan and up the sides. 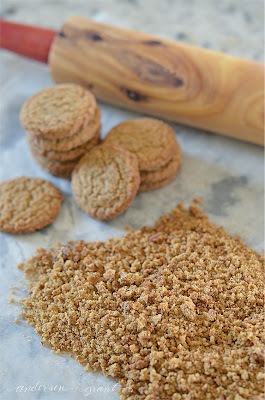 To make the crust: Use a rolling pin to crush about 20 gingersnaps for the crust. In a small bowl, combine the crumbs and melted butter and then press them into the bottom of the prepared pan. Place the spring form pan on a baking sheet and bake it at 350 degrees for 8 to 10 minutes. Cool the crust on a wire rack. 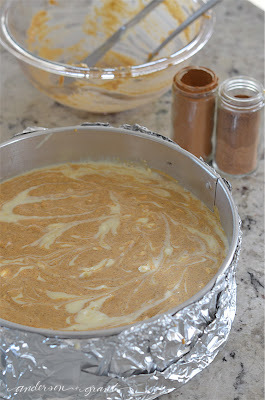 To make the cheesecake: Using a mixer, beat one package of cream cheese, 1/2 cup of the sugar and the cornstarch until it is smooth, about 2 minutes. Beat in the remaining cream cheese one at a time until the mixture is smooth. Add the remaining cup of sugar and vanilla. Then add the four eggs and beat on low just until combined. Place 2 cups of the filling in a separate bowl. Stir in the pumpkin, cinnamon, and nutmeg to the 2 cups of filling. Then remove 3/4 cup of this filling and set it aside in another bowl. Pour the remaining 1 1/4 cups of pumpkin filling over the crust. Top that with the plain filling and cut through it with a knife to swirl. 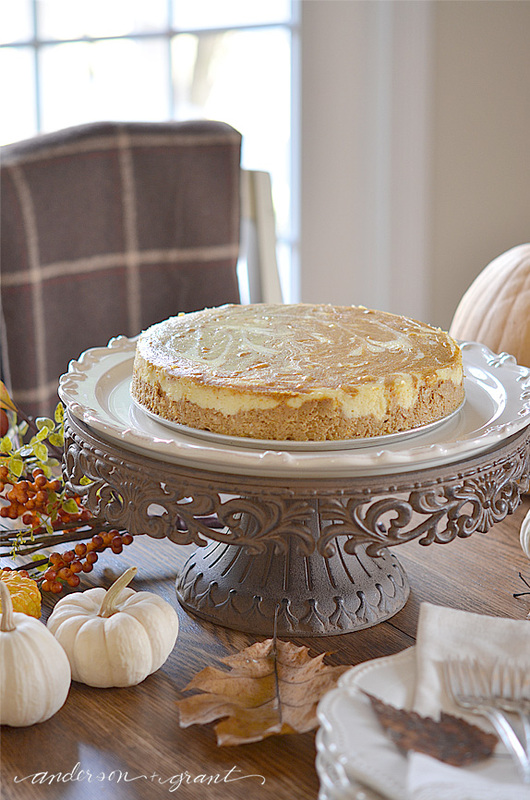 Then drop the reserved pumpkin filling by spoonfuls over the cheesecake. Again, cut through into the plain filling with a knife to swirl. Place the spring form pan into a large baking dish. Add 1 inch of hot water to the larger pan. 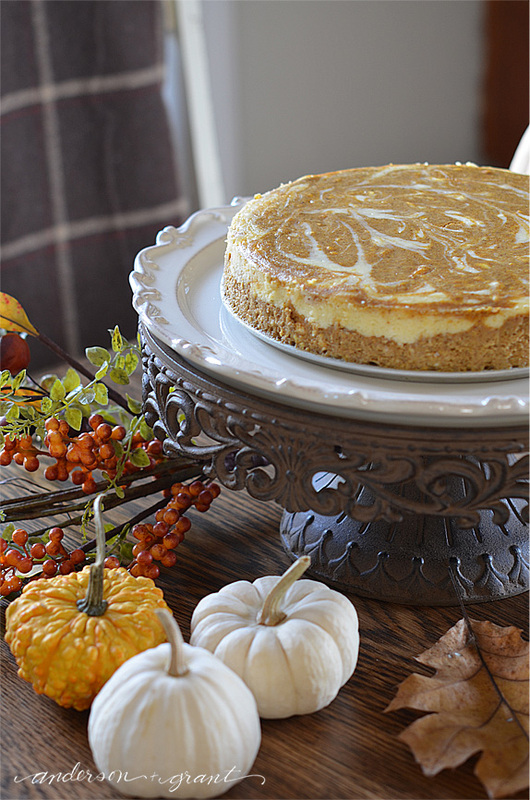 Bake the cheesecake at 350 for 55 to 65 minutes until the center is set and the top appears dull. Remove the cheesecake from the water bath and cool it on a wire rack for 10 minutes. Run a knife around the edge to loosen it from the pan. Cool one hour longer. Refrigerate overnight. 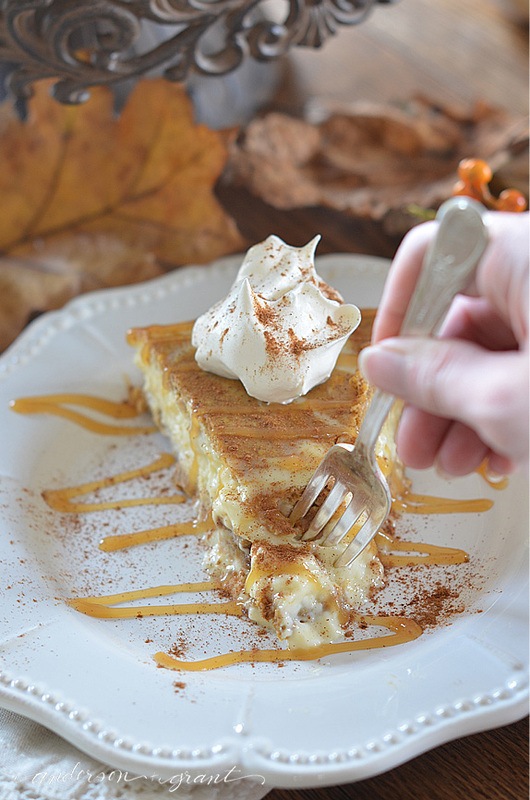 Garnish the slice of pumpkin cheesecake with caramel sauce, a dollop of whipped cream, and a garnish of more cinnamon.